The first of two Wrestling Dontaku events takes place tonight, with the two top matches highlighting the divisions within the Bullet Club. 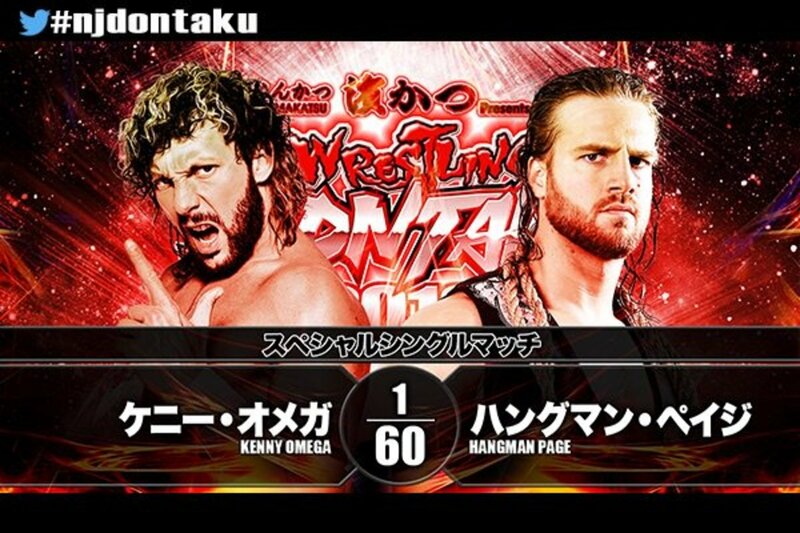 In the main event, Kenny Omega takes on Hangman Page. Page has so far sided with Cody in the split thus far. He also has a win over Kota Ibushi from Supercard of Honor, so he does have momentum heading into this match. Omega is one of the bigger draws in New Japan, while Page has yet to be tested in such a high-profile match. It remains to be seen how people will react to a main event such as this. In another special singles bout, Cody will once again battle Ibushi. The two originally squared off at Wrestle Kingdom 12, where Ibushi defeated Cody. This will be their first match against one another since the formation of the Golden Lovers, which happened immediately after Cody turned on Omega. There will also be a number of tag team matches, including Hiroshi Tanahashi & KUSHIDA teaming up to take on Kazuchika Okada & Will Ospreay in a preview of their respective matches tomorrow. Action will start at 4 a.m. ET. There will be English commentary. The Bullet Club members were wearing robes celebrating their fifth anniversary as a group. Short, simple match. At his current level of experience, Tsuji looks perfectly fine. Both Yujiro and Owens were stiff with him. Owens picked up the win after pinning Umino with a package piledriver. A solid tag team match, though there wasn’t much of note here and didn’t last long enough to build to anything..Taguchi pinned Narita with the dodon. This was fast. There was some brawling on the outside, much like any other Suzuki-gun tag match. Iizuka was biting SHO’s hand, and the referee didn’t like that. As Iizuka was arguing with him, SHO rolled up Iizuka and pinned him. A good match, as this was the first bout that had some heat. People were really into Juice and his offense. It boiled down to White and Henare. The latter escaped from a Bladerunner, but White drilled him with suplexes then pinned him with a Bladerunner that connected. Pretty good match. The Bucks did their usual stereo offense that looked great. They were all cordial with one another at the start of the match. Early portion had everyone try to take out Fale, but he had an easy time overpowering the challengers. The champions hit a magic killer with Fale hitting a big splash in the final minutes, but Matt kicked out. Nick helped clean house as they hit the More Bang For Your Buck on Tanga Loa to win the titles. The former champions grabbed the belts after the match and handed it to the new champions in a sign of respect. Bone Soilder is still returning. This got good after a while. Of course, Naito and Suzuki immediately went at it, as did the four juniors. Suzuki took Naito into the crowd and threw guardrails and chairs at him. Suzuki and Sabre worked him over in the ring. Naito and the rest of LIJ started to rally a comeback and took everyone out. EVIL then laid out Kanemaru with the STO for the win. Naito continued to attack Suzuki after the bell. The Young Bucks came out and said it was time to make a big boy challenge, and issued a challenge to SANADA and EVIL. They seemingly accepted the challenge, but then ate superkicks from both Bucks. The Bucks immediately retreated as the rest of LIJ entered the ring. EVIL then took a mic and officially accepted the challenge. KUSHIDA worked over Ospreay’s neck, which will likely play a role in their title match tomorrow. Ospreay did the same thing to KUSHIDA, since his neck is all taped up as well. This was your typical tag match where one rival worked against the other, so Ospreay/KUSHIDA and Okada/Tanahashi worked most of the match with one another. Okada laid out KUSHIDA with a tombstone, took out Tanahashi, then pinned KUSHIDA with the rainmaker. The start of this match was really just there, nothing interesting. It picked up in the middle and got very good by the end. The crowd wasn’t totally into the match, but the work was good and they did react to big spots. Cody works over Ibushi both out of and in the ring, working him over with a figure four leglock. Ibushi fires back with a dropkick and the Golden Triangle moonsault to the floor. They engage in a slap battle, with Cody getting the better of it but Ibushi unleashes a clothesline that wipes out Cody. Cody collides into Red Shoes as he exits the ring and gets a table. He sets it up in the ring, then takes Ibushi to the top rope. Ibushi takes Cody to the top of the table and hits a foot stomp...that doesn’t break the table. He connects with another at at least breaks the table a bit, but also slices Cody’s back. Ibushi hits a Last Ride powerbomb as he goes for the kamigoye. Cody manages to avoid it twice and exits the ring into the crowd. Ibushi does an incredible dive from the top rope into the crowd, right on top of concrete. Cody catches Ibushi as he enters the ring and hits crossroads, but Ibushi kicked out. Cody sets up for his vertebreaker called Din’s Fire (a reference to a magic spell from Zelda: Ocarina of Time) and connects for the win. This had lots of great action and some very cool spots, but I don’t think it was a main event caliber kind of match. It was really good, but not great. Part of it was the crowd who barely reacted to anything beyond the big spots, another part is I never really bought Page had a chance of winning at any time during the match. Cody jumped Omega right before the bell rang and looked to set up another table. Omega did a baseball slide taking Cody out and did the Rise of the Terminator tope con hilo that took out Cody. Page connected with a gigantic moonsault off the turnbuckle to the floor, wiping out Omega who was on the outside. Page followed with a Rite of Passage right on top of the table. Page introduces a chair as Omega’s head is busted open. Page shoves the referee down. They go back to the outside, where Omega counters with a snap suplex and a back suplex on the apron. Omega went for a moonsault on top of the barricade but landed on his feet and instead clotheslined Page, who soon after fired back with a slingshot lariat. There’s a bit of back and forth in the ring. Omega tries for a v-trigger, but Page dodges and connects with a package piledriver. He then lands a gigantic neckbreaker off the top rope. Omega starts to rally and hits a v-trigger. Omega tries for the One Winged Angel but Page escapes. Page tries to hit a rebound clothesline but Omega connects with another v-trigger. Omega hits another v-trigger, then a piledriver. Another v-trigger and a One Winged Angel gives him the win. After the match, Omega put over the crowd and thanked them for coming. This show felt like a really nice Korakuen Hall show minus the great heat. It’s very weird. The top two matches were very good in execution, but didn’t feel like hot main events. The rest of tonight’s card was okay, with the start of some build towards Dominion being the highlight.